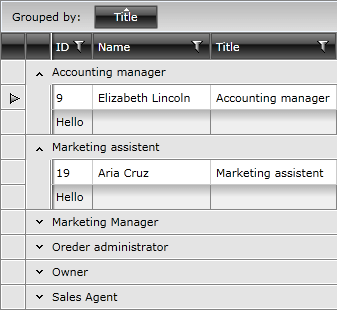 RadGridView exposes group footers features which provide the option to render a footer under each group in the grid. 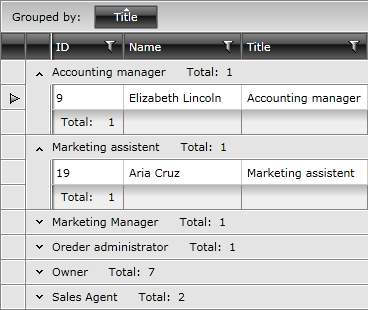 Group footers display group summaries and contain footer cells that correspond to data columns. Before continuing with this topic make sure that you are familiar with the Visual Structure of RadGridView. In order to enable the group footers functionality, merely set ShowGroupFooters property of RadGridView to True. The default value of ShowGroupFooters property is False. The same operation can be done in the code-behind. 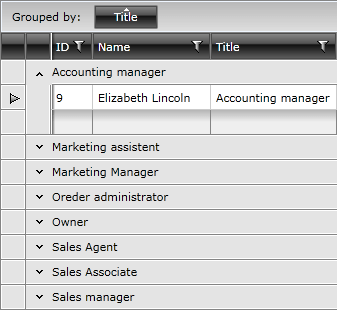 If you want your group footers to have a static content, simply configure GroupFootersTemplate property. The result can be seen on the next image. RadGridView will calculate aggregates over the entire data source and will respect the filter expression applied (if present). If you want to learn how to style group footers take a look at the Styling Group Footers topic. Check out the following topics which explain in great details RadGridView's grouping functionality. Learn the basic of the grouping behavior. You can modify the default template of displaying group aggregates by applying a new GroupFooterTemplate configured it per specific requirements. The GroupFooter's DataContext is AggregateResultsList.